Supervisor Jacobs Gibson has devoted much of her career to promoting more affordable homes for people in San Mateo County. When housing prices rose rapidly during the dotcom boom of the 1990s, Peninsula Interfaith Action (PIA) organized a rally of 1100 people in Redwood City in 2000. They presented a study to the Board of Supervisors, and she and Supervisor Rich Gordon helped create the groundwork for a local housing trust fund. HEART was officially formed as a Joint Powers Authority (JPA) in 2003. Rose succeeded Rich Gordon and Supervisor Carole Groom as the third chairperson of HEART in 2009. Under her leadership, HEART completed a successful $3 million capital campaign, made a $1 million emergency loan to MidPen Housing to continue construction of Peninsula Station family apartment in San Mateo when state funds were frozen, and completed a comprehensive business plan. Rose helped introduce our keynote speaker from Facebook to the housing community at last year’s lunch during Affordable Housing Week. 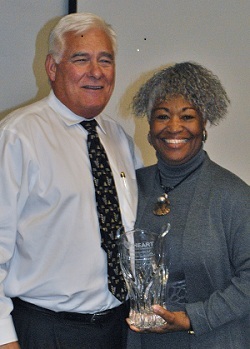 HEART thanks Supervisor Jacobs Gibson for her service.